This weekend was the first comp weekend of the year for the Baptist Church Fishing Club. After winning senior male two years in a row, I decided this year to take a back seat and try to get the kids and Tania more involved. 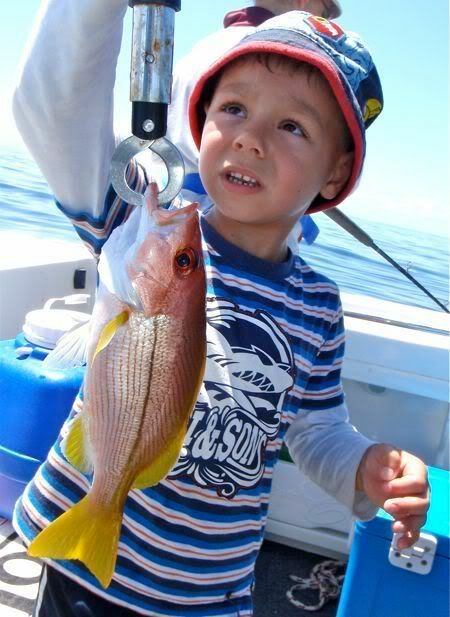 But, as we soon found out, its tough trying to get a 5 year old to land keeper fish on the shoals! More about that later. I would have rather fished the creeks with the family this weekend and chase some Jacks, Bream and Barra. But the weather was just looking too good, and the big boat needed to get wet! So it was looking like a shoal run was on the cards. We woke the kids about 3am and rush to the ramp hoping to get a park! Launching at 4.15am we managed one of the last couple of parks before heading wide. I took it easy on the way out, sitting on about 18knots all the way. Tania and Sebastian were sleeping in the cabin, and I was concerned about floating debris after the floods. So it took us a long, but comfortable, hour to get to our destination. On arrival things looked very quiet. On a shoal that is usually lit up with bait and fish, we were hardly getting a show at all. We dropped some baits and found small fish and a couple of Trevalley all that was on offer. We hunted around a few different marks in search of better fish, and eventually found some Nannygai feeding on an old favourite mark of mine. I landed 2 fish around the 45cm mark, but Tania couldn't get a keeper. The bite here slowed pretty quick and moved on. At our next destination there were plenty of fish, but mostly small stuff. So I got out Lachy's rod and got him onto some fish. He had a ball landing sucker fish, Hussar and Nanny's. 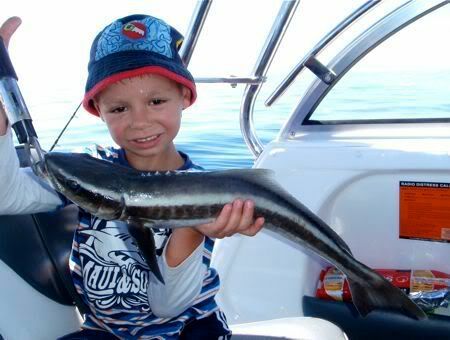 But his best fish was a nice little Cobia. 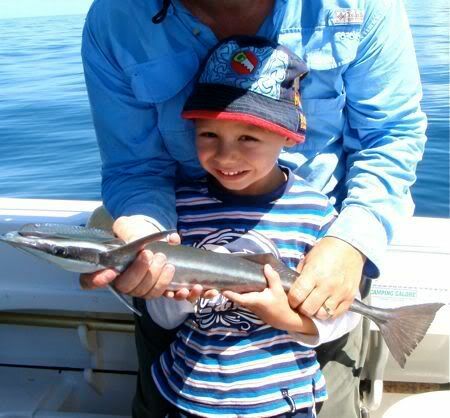 In the mean time Tania had managed 3 thumper Doggie Mackerel and lost a BIG Nannygai to a HUGE shark! The shark took pretty much everything, so we moved yet again. Next spot I got Lachy fishing again. But we were about to learn it isn't a good idea to fish shoal country with light gear. Lachy has a Symeter 2500 with 8lb finns braid. He was winding in a bait from the bottom when it took of at a million miles an hour. My immediate thought was Spanish Mackerel, and withing literally seconds I was seeing the bottom of the spool through the line. A VERY quick start of the motor and shove into reverse saved the day. We tracked the fish around for a good 20mins before we caught a look. Bluefin Tuna, and at 10-15kg it was going to be a tough battle on 8lb with a 5 year old in charge! He was hurting and had well and truly had enough. We kept him going with lots of encouragement and tried to make him realise that he couldn't weigh the fish if he didn't land it by himself. But it wasn't to be. Mum had to take over. And 15mins later and we were no closer to getting a gaff in! We had had the fish up many times, but each time it just took off back to the depths. By this time Tania had also had enough. So, against my better judgment, she started to apply some extra pressure. It seemed to be working as she got the fish closer and closer, but eventually the pressure was too much and like snapped. To top it off the rod hit the stainless targa as the line let go and the rod broke too!!! 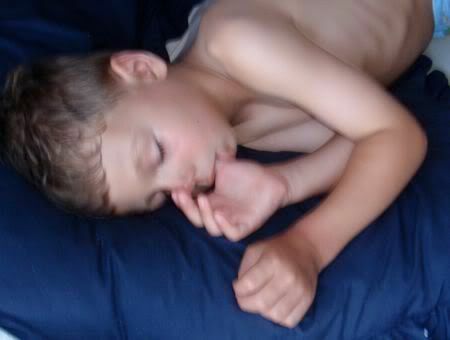 Lachy was stuffed and soon fell asleep in the cabin. We headed for home, but I had one last crack at the North Cardinal. A couple of drops of a 40g knight and I had a small mackerel beside the boat, but it flicked off. A couple of drops later and I got bitten off. Oh well, home time....Next time I think we will get the kids into the creeks for the comps!